Sarah Szold Boasberg (1937-2012), known to her friends as Sally, passed away at her home in Washington, DC, on March 28, 2012, surrounded as her husband Tersh wrote, by "her family, her garden, and the flowers of Spring." Sally could always be counted on for her probing intellect, determined opinions, crisp humor, calming disposition and genuine warmth. Sally took a remarkable bite out of life and was a greatly beloved friend. On behalf of The Cultural Landscape Foundation’s Board and staff, I wish to say how very deeply saddened we are at her passing and extend heartfelt condolences to her husband Tersh, her children and grandchildren. Sally Boasberg in Lawrence Halprin's Lovejoy PlazaSally’s connection with TCLF began very early. In 1998, she, her husband Tersh and I, working together at the Boasberg family dining room in Washington, DC, drew up the legal documents that created the foundation. Tersh provided the pro bono legal work and Sally agreed to serve as a founding co-chair. Throughout the years, her counsel, clarity of vision and concise observations were not only invaluable, they were frequently quite funny. Hers was a life well lived – and as we mourn we also recall and celebrate her life, achievements and legacy. Sally was born in New York in 1937 and raised in Brooklyn Heights in the “old house of the first Mayor of Brooklyn,” she recently said, though her “social life was in Manhattan.” On the weekends she would go to the family farm in Orange County where her dad raised Holstein cows. Her parents also had an enormous vegetable garden, and Sally said, “we ate in a way that I have never eaten since; you don't know what fresh vegetables taste like - baby lima beans, tiny fresh beans every day, freshest of corn, wonderful raspberries. I went back for raspberries because I had to have them 4 times a day.” That last line was delivered in typical Sally fashion, as an inviolable and unalterably logical declarative. (left to right)When asked about her interest in horticulture and landscape architecture, she noted several influences: the family farm, her father’s board membership on the Brooklyn Botanical Gardens, and her visits to the Botanic Garden at Smith. She had thought of taking a horticulture class in college, but, it met at the wrong time so she never took it. designed Sheats Goldstein ResidenceNevertheless, Sally earned a Certificate in Landscape Design from GWU, in 1985. After graduation she remained engaged with the University teaching classes and actively advancing and promoting the program. Never a bystander, she contributed her talents to numerous groups. An ardent leader, her lifelong dedication to the environment, horticulture, education and cultural landscapes became the focus of her years of service to Washington, DC and many local and national organizations. For more than twenty-five years she developed a successful landscape design practice. An avid gardener she transformed her own garden into a nationally recognized woodland sanctuary that she and Tersh frequently opened to benefit a variety of organizations. As a member of Committee of 100 on the Federal City she chaired the subcommittee on City Street Trees and earned their Vision Award for the report “Re-Greening Washington: Managing the Street Tree Crisis in our Nation’s Capital.” She served as a member of the Casey Tree Endowment Fund Technical Advisory Board whose goal was to protect, restore and enhance the tree canopy of Washington, DC. Her concern about the diminished tree canopy led her to play a central role in the creation of the District’s Urban Forest Protection Act in 2002, an act that established a permitting process with heavy fines for the removal of large caliper trees on private property. She was the Founder and President of Green Spaces for DC, a non-profit organization which worked with the city’s department of Parks and Recreation (DPR) to provide and promote open and accessible recreational spaces. In 2004, Green Spaces provided seed money to hire the first landscape architect for the District of Columbia’s DPR. 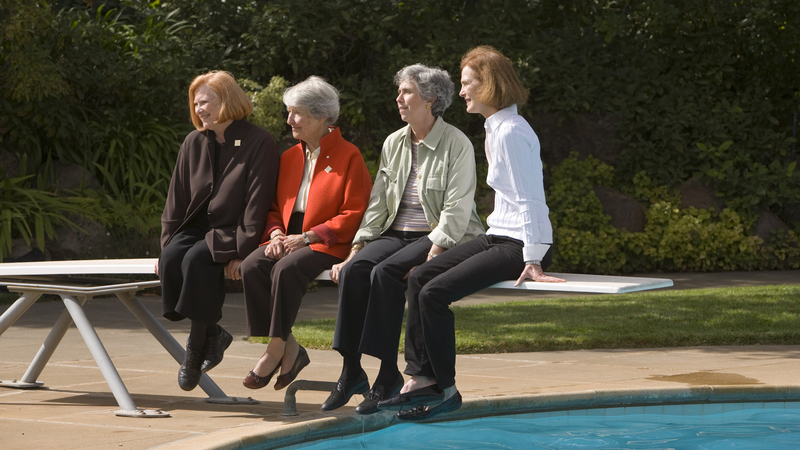 Boasberg served as Chairman of the American Horticultural Society and was Vice President of the Friends of the National Arboretum where she served as head of the Master Planning Committee. She was a member of the Board of Directors of US/ICOMOS, Trees for the City (Washington DC) and the Tregaron Conservancy. She has served as a trustee of Smith College, Knox College, the National Cathedral School and The Washington Opera. She was an active affiliate member of the American Society of Landscape Architects (ASLA) since 1991. In 2007 ASLA honored her for her work and awarded her the LaGasse Medal in the Non-Landscape Architect category for her leadership in conservancy of natural resources and public landscapes. Of her long-standing involvement with the National Arboretum, Sally said: “It answers the part of me that is a plant nut and I wanted to foster that part of people's knowledge. They can come to the Arboretum for peace, and also to discover a new plant that they can grow in their own garden. The view across the meadow to the Capitol Columns by Russell Page is a spectacular view. Or [you can] find an azalea that you love and you want to have in your own garden. It’s an encyclopedia." On behalf of our Board of Directors and staff, thank you Sally for the many hours we shared over the many years, and in many astonishing landscapes. And, thank you for your legacy, which we shall do our best to honor. Knowing how important education was to Sally, the Foundation announces the creation of the Sally Boasberg Founder’s Fellowship.